We love fall in our family! The leaves are turning colors and my house smells of apples and cloves as I bake and diffuse. One of our favorite activities each season is nature study, and we love observing the change of seasons in our favorite places. We try to take time on every outing to pause at a scenic spot to sketch or play. 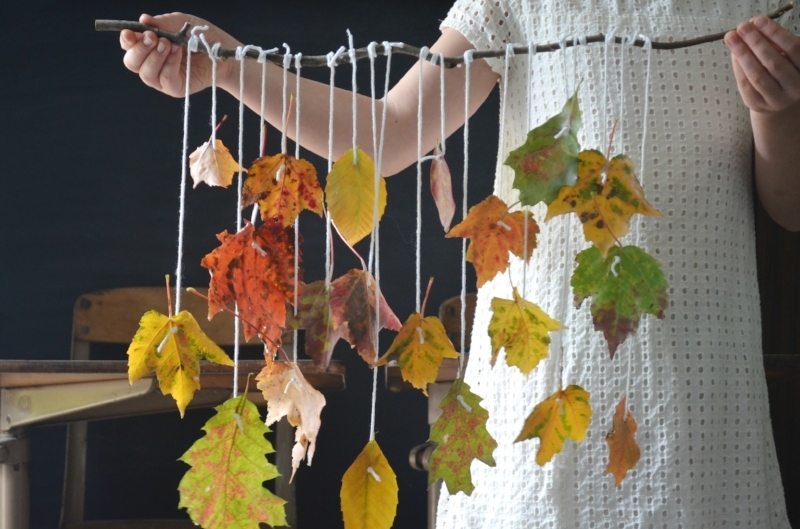 Sometimes getting young children to actually observe nature, requires giving them a craft that involves natural materials. This allows them to slow down enough to actually observe the leaves, bark or feathers that they are supposed to be studying. One of the resources that we are using this year, is the book, Exploring Nature With Children, by Lynn Seddon. This manual includes activities, book suggestions, an overview of the topic and even poem and art suggestions to go along with the theme of the week. We also enjoy collecting leaves on each of our outings and identifying the trees they came from. 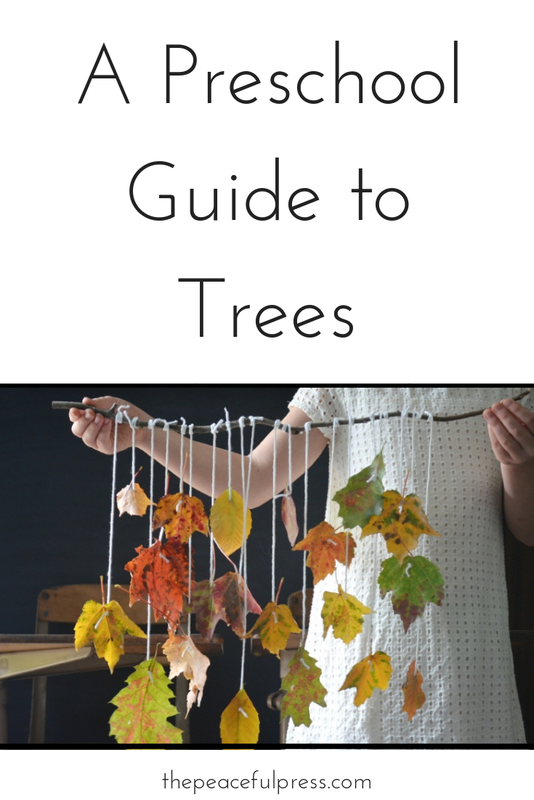 Our new Tree Guide has been a helpful resource for observing trees and enjoying the fall season. We have also used the book, Look What I Did With a Leaf for our annual leaf creatures, and one of the girls in our local nature group, made this fabulous horse, using ideas from the book. Another family fall tradition that we have is a visit to a place called Apple Hill. We don't live as close as we used to, but purchasing fresh apples and fresh apple donuts is worth the drive. You may have apple orchards or pumpkin patches near you where you can celebrate the changing season. We also enjoy the season by reading books nature and fall related books. We have many free items for your family. Parent guides, children’s activities, printable and book lists to give you a taste of The Peaceful Press Curriculum. Click the button below for access. We are in the depths of early childhood. Just past the sleepless nights and constant nursing, but still in the expanse of that sweet age of boundless energy and curiosity that is so fleeting. There was no doubt when we implemented The Peaceful Preschool last year that it would be a perfect fit for our family. My eldest daughter has always loved books and this gentle, literature based approach was just what our family needed. It brought such a peaceful rhythm to our learning and I am thankful to have been able to begin our homeschooling journey in a peaceful way from the start. Much of homeschooling last year would find us snuggling on the couch or under a tree reading books and then re-enacting the stories, painting with watercolors, and hanging letters on our school room wall with pride and accomplishment. Then outside we went! Much of our day you can find us outdoors, weather permitting. Exploring the woods next door, walking to a favorite local spring fed stream with friends, and hiking a new trail. So much growth and knowledge can occur when in nature, especially in the early years. Respect is learned for creatures, gentleness when one finds a butterfly, attention is stretched when observing more and more details of a little lady bug who decides to visit a while. Perseverance and determination are developed when hiking and littles learn that one step taken is one step closer to the goal. We also started tea time, which has been such a blessing! When we are having a hard day, whether it be difficult feelings or just bad attitudes, putting everything aside to sit and have tea has proven countless times to reset our day. We read poems, enjoy tea (in our case apple juice), talk, and giggles are sprinkled throughout. By the time we are done with tea we leave the table with a deeper understanding and love for one another. Homeschooling with littles is a bit different this year than it was last year. We are three weeks in with The Playful Pioneers and my youngest, who is two, is showing more and more interest in what we are doing. While at times it can be so tempting to distract and give her something else to do, I have found it more helpful to include her. Toddlers are so curious and what better way to hone in on their desire to learn than to welcome them in with arms wide open. While I’m reading from Farmer Boy my youngest plays with her little wooden barn while my five year old does copy work or works on weaving. The activities in The Playful Pioneers are so easily adaptable between ages, which I love. My toddler is always right in the midst of it and along the way we are learning patience, helpfulness, and forgiveness. And grace, oh so much grace. Easier said than done, but from what I’ve gleaned from seasoned mamas who have been there and have seen the fruits of their labor… it is hard work, but it is so worth it. Are you in need or reading resources for your young learners? This post contains a few of our favorites. Math can be fun. This post shares a few resources that can help shape a positive view. The beach is our favorite place to relax and rest, but it's also a wonderful place to learn and a wonderful place to learn about. The sensory input of waves, sand, and seashells awaken learning in young children and engage their imagination. There are so many ways to bring ocean themed learning into our homes, and our new The Peaceful Preschool: Ocean Unit has been created to make the transition from summer fun into fall learning, a playful one. The unit includes developmentally appropriate learning activities to refine large and fine motor skills, phonics and counting skills, and listening skills as your children grow. The Ocean Guide includes the same components as our well loved, The Peaceful Preschool, with whimsical, ocean-themed counting, phonics, practical life, and motor skills activities to make learning feel like play. 1. Count and sort seashells. 2. Hide cotton ball "sea turtle eggs", in sand. Use tongs to collect and count the eggs. 3. Read ocean themed poetry (included in the guide). 4. Do a crab walk. 5. Make a seashell mobile. 6. Make an octopus craft. 7. Measure and stir salt into water. As you do these simple activities with your children, you are building memories, while simultaneously building pathways in the brain that will enable your child to excel in school, and give them the imagination and confidence to help them excel in life. Do you need help choosing a writing or math curriculum? We share our favorites here and here. This post contains affiliate links. Thanks for clicking through and supporting our site.